(Nanowerk News) Unlike many other organisms, plants can’t simply run away from environmental conditions that change for the worse. Nonetheless, plants have the ability to react to environmental effects. These reactions are initially subtle: they occur within their individual cells. 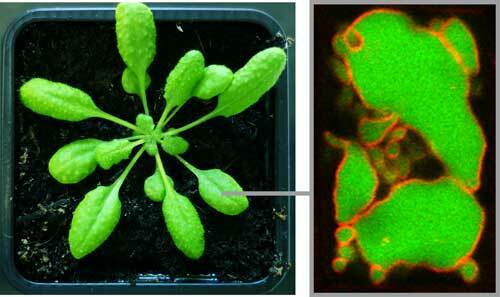 Plants move proteins inside these cells. This process, known as protein transport, is the foundation for a complex biological response mechanism. During every second of a plant cell’s life, a multitude of protein transports take place. But how does the cell coordinate movements of the proteins through its transportation networks? How does the cell correctly “label” the protein for transport and make sure that it reaches its intended destination? Prof. Erika Isono and fellow biologists in Konstanz are carrying out research to answer these questions. They have now discovered a previously unknown function of the SH3P2 protein, which plays an important role in this transport process. Their research results were published recently in the scientific journal Proceedings of the National Academy of Sciences ("Arabidopsis SH3P2 is an ubiquitin-binding protein that functions together with ESCRT-I and the deubiquitylating enzyme AMSH3"). Plasma membrane proteins that are to be degraded are transported to the vacuole, the largest cell compartment in the plant cell. For this reason, the transport pathway of a protein from the plasma membrane to the vacuole is one of the major transport pathways within a plant cell. The cell has created its own transport system for the trafficking of proteins: In preparation for transport, the proteins bud off as vesicles together with the surrounding membranes and are then “labelled” for delivery by special modifier proteins called ubiquitin to be delivered to the intended address. The ubiquitin molecule marks the protein for transport. In other words, it acts as the “address label” for a protein package. Transport proteins recognize and bind ubiquitin and carry the freight to its intended destination – to the vacuole, where the protein can be degraded. Erika Isono and her team are currently examining a crucial step in this labelling and transportation process: “Our research demonstrates that the SH3P2 protein can first identify and then connect to ubiquitin molecules. We have found evidence that it functions as a ubiquitin adaptor protein”, explains project member Marie-Kristin Nagel. Figuratively speaking, SH3P2 takes on the role of a barcode scanner. It detects the ubiquitin-marked package and guides it to the next station within the transport network – the so-called ESCRT machinery, through which it then reaches the vacuole. "The SH3P2 protein was previously known for its roles in autophagie (the recycling of cellular components) and in cell division. That it interacts with ubiquitin is new”, indicates Marie-Kristin Nagel. An additional protein plays a special role in this process and in the current research being carried out by the biologists in Konstanz – the so-called AMSH protein. AMSH is an enzyme that has the capability to remove ubiquitin. The label is detached and the protein package is returned to the sender. Now without a shipping address, the protein cannot be taken to the vacuole to be degraded. Instead, it is returned to the plasma membrane.